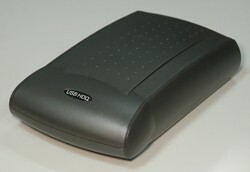 The Model BF-2003 USB 2.0 Hard Drive Case uses the much faster USB 2.0 protocol, with bus speed of 480 Mb/s. It will accept any 3.5 inch IDE Hard Drive. The unit is compatible with Windows 98, ME, XP and 2000. It can also be used on Macintosh computers running OS 8.6 thru 9.1. The case contains an internal cooling fan. An external power supply is provided. The Model BF-2003 lets you take any 3.5" hard drive and turn it into a high-speed portable storage device. The drive installs easily inside the case. All hardware is provided. These devices are ideal for file backup and transferring large files between computers. This device requires a computer with a USB 2.0 connection, for high speed operation. USB 2.0 can be added to desktop and laptop computers by using our IC-250U or PU-212B add-in cards.